How the Eurozone will be governed in the future is a matter of much debate and is expected to form a key part of the European Council meeting on 28-29 June. Kevin Featherstone argues that the debate is neglecting a key set of questions: how can its governance be made more democratic and accountable? The answers to these questions will likely impact on the expansion or shrinking of the countries participating in the euro in the longer-term. But the debate was suddenly heightened by the ambitious pronouncements of the new French President, Emmanuel Macron, last year — particularly, his ‘Initiative for Europe’ launched at the Sorbonne in September. Keen not to be overtaken, the EU Commission President, Jean-Claude Juncker, made further, parallel proposals in December. The key bargaining is, inevitably, between Paris and Berlin, where Chancellor Angela Merkel faces difficulty in getting her Christian Democratic Union (CDU) party on board, even if she wished to. 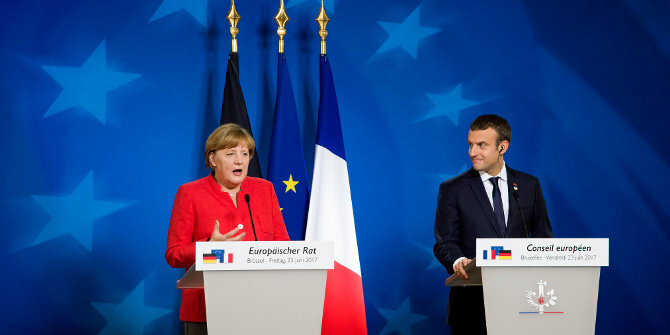 It’s not clear how she will make good on her initial warm words to Macron when the matter is discussed by the European Council at its meeting on 28–29 June. The intention was to agree a roadmap for eurozone reform at the summit, but few now expect any bold moves to be made soon. This slow pace of progress is risky. German views on euro-governance are more complex than Juncker’s and Macron’s, if not confused. When negotiating the Maastricht Treaty, some like Hans Tietmeyer (later to be president of the Bundesbank) saw the necessity of building a political union in Europe before embarking on a single currency. This was dubbed the ‘coronation theory’ of the Economic and Monetary Union. Others, while supporting the hotchpotch political union placed in the Maastricht Treaty, wanted to block a fiscal union for fear of the liabilities to Germany. In recent years, both Merkel and her former finance minister, Wolfgang Schauble, have talked of a need to strengthen economic governance in the eurozone. But they have emasculated Bérégovoy’s original ideas by placing them firmly within the traditional German rules-based frame of ‘ordo-liberalism’. A central tenet of the latter is to place responsibility for fiscal policy — through binding rules and at the risk of penalties — on national governments. This leaves little scope for EU-level competences. Thus, the CDU recently issued a statement rejecting Macron’s ideas as they involve “even more common liabilities, bureaucracy and centralism”. How can the EU intervene to support member states who want to converge, but are unable to? Somewhat tellingly, on the particular issue of possible bail-out type interventions in the future, they saw this responsibility being given to an expanded European Stability Mechanism. The ESM would design and negotiate the conditional assistance programmes. Its board of directors would be appointed similar to that of the IMF’s governing body. And, the ESM’s managing director would be obliged to answer questions from the European Parliament. Financial control — whether to provide the money — would remain with the member states. Note: This post also appeared on the Dahrendorf Forum site and LSE Brexit. The article gives the views of the author, not the position of EUROPP – European Politics and Policy or the London School of Economics. Kevin Featherstone is Eleftherios Venizelos Professor of Contemporary Greek Studies and Head of the European Institute at the London School of Economics.